These spells are suitable for a campaign that visits the City of Brass or that takes place in a setting where fire, heat, and the desert loom large, such as the Southlands. 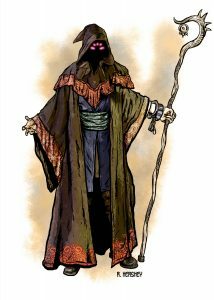 They’re geared toward wizards, but there’s no reason why sorcerers and warlocks—or even clerics and druids—can’t have access to them if you decide it’s appropriate in your campaign. The evil eye takes many forms. Any incident of bad luck can be blamed on it, especially if a character recently displayed arrogance or selfishness. When avert evil eye is cast, the recipient has a small degree of protection against the evil eye for up to 1 hour. While the spell lasts, the target of the spell has advantage on saving throws against being blinded, charmed, cursed, and frightened. During the spell’s duration, the target can also cancel disadvantage on one d20 roll the target is about to make, but doing so ends the spell’s effect. Candle’s insight is cast on its target as the component candle is lit. The candle burns for up to 10 minutes unless it’s extinguished normally or by the spell’s effect. While the candle burns, the caster can question the spell’s target, and the candle reveals whether the target speaks truthfully. An intentionally misleading or partial answer causes the flame to flicker and dim. An outright lie causes the flame to flare and then go out, ending the spell. The candle judges honesty, not absolute truth; the flame burns steadily through even an outrageously false statement, if the target believes it’s true. Candle’s insight is used across society: by merchants while negotiating deals, by inquisitors investigating heresy, and by monarchs as they interview foreign diplomats. In some societies, casting candle’s insight without the consent of the spell’s target is considered a serious breach of hospitality. When daggerhawk is cast on a mundane dagger, a ghostly hawk appears around the weapon. The hawk and dagger fly into the air and make a melee attack against one creature you select within 60 feet, using your spell attack modifier and doing 1d4 + (your spellcasting ability modifier) piercing damage on a successful hit. On your following turns, you can use a bonus action to cause the daggerhawk to attack the same target. Once a target is selected for the daggerhawk, it can’t switch to any other. 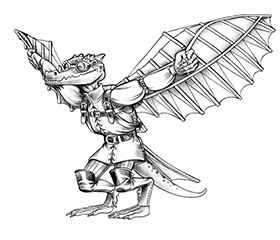 The daggerhawk has AC 14 and, although it’s invulnerable to all damage, a successful attack against it that does bludgeoning, force, or slashing damage sends the daggerhawk tumbling, so it can’t attack again until after your next turn. The target of feather travel transforms into a feather (along with their clothing and other gear) and drifts on the wind. The drifting creature has a limited ability to control their travel. They can move only in the direction the wind is blowing and at the speed of the wind. They can, however, shift up, down, or sideways 5 feet per round as if caught by a gust, allowing them to aim for an open window or doorway, to avoid a flame, or to steer around an animal or another creature. When the spell ends, the feather settles gently to the ground and transforms back into the original creature. At Higher Levels. When you cast feather travel using a spell slot of 3rd level or higher, two additional creatures can be transformed per slot level above 2nd. When this spell is cast on any fire that’s at least as large as a small campfire or cooking fire, three darts of flame shoot out from the fire toward targets within 30 feet of the fire. Darts can be directed against the same or separate targets as the caster chooses. Each dart does 4d6 fire damage or half damage with a successful Dexterity saving throw. When you cast breeze compass, you must clearly imagine or mentally describe a location. It doesn’t need to be a location you’ve been to as long as you know it exists on the Material Plane. Within moments, a gentle breeze arises and blows along the most efficient path toward that destination. Only you can sense this breeze, and whenever it brings you to a decision point (a fork in a tunnel, for example), you must make a successful DC 8 Intelligence (Arcana) check to deduce which way the breeze indicates you should go. The spell ends if the Intelligence check fails. The breeze guides you around cliffs, lava pools, and other natural obstacles, but it doesn’t avoid enemies or hostile creatures. Tongue of sand is similar in many ways to magic mouth. When you cast it, you implant a message in a quantity of sand. The sand must fill a space no smaller than 4 square feet and at least 2 inches deep. The message can be up to 25 words. You also decide the conditions that trigger the speaking of the message. When the message is triggered, a mouth forms in the sand and delivers the message in a raspy, whispered voice that can be heard by creatures within 10 feet of the sand. Additionally, tongue of sand has the ability to interact in a simple, brief manner with creatures who hear its message. For up to 10 minutes after the message is triggered, questions addressed to the sand will be answered as you would answer them. Each answer can be no more than 10 words long, and the spell ends after a second question is answered. This spell intensifies the light and heat of the sun, so it burns exposed flesh. You must be able to see the sun when you cast the spell. The searing sunlight affects a cylindrical area 50 feet in radius and 200 feet high, centered on the target point. Every creature that starts its turn in that area takes 5d8 fire damage or half damage with a successful Constitution saving throw. A creature that’s shaded by a solid object such as an awning, a building, or an overhanging boulder has advantage on the saving throw. On your turn, you can use an action to move the target point up to 20 feet in any direction along the ground. Read more of these spells and the City of Brass—and read other great articles—in Warlock, only on Patreon!